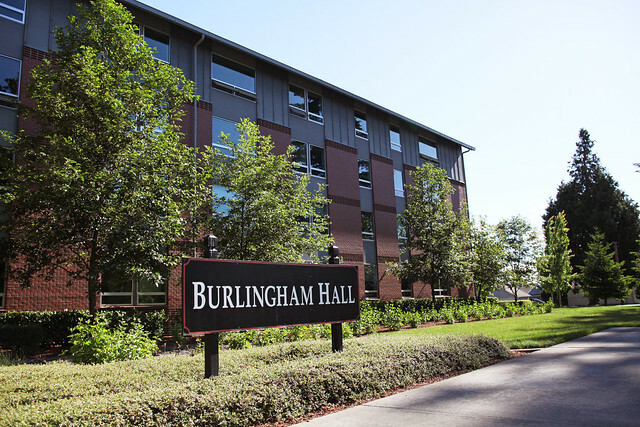 Built in 2007, Burlingham Hall is a Pacific University residential building for students that are 19 years old or older prior to the start of the Fall term or have fulfilled one-year of the Pacific University's two-year residency requirement. The sustainable building features apartment and suite-style accommodations, along with a community kitchen, lounges and laundry facilities. Burlingham Hall is located on the north side of campus, east of Vandervelden Court and next to the Stoller Center. This four-story facility was specifically built to connect the residents with each other and the Pacific campus. Living in Burlingham gives students a sense of community while also giving the student the positive aspects of independent living. This building houses students that are 19 or older prior to the start of the Fall term or have fulfilled one-year of the University's two-year residency requirement. Each apartment has four single bedrooms and two full bathrooms, and a full size kitchen, complete with a cooking island, refrigerator, oven, and sink, and an open shared living area. The two bathrooms each have a tub/shower combination with access to one shared sink/vanity area. Each bedroom has individual closet space and the apartment has at least one additional shared storage closet. Each apartment has two double bedrooms and two single bedrooms, and an open shared living area. There is a full size kitchen with a breakfast bar and bar stools, refrigerator, oven, and sink. There are two bathrooms each with a tub/shower combination and access to shared sink/vanity area. Each bedroom has individual closet space and the apartment has at least one additional shared storage closet. Each suite has one double bedroom and single RA room, two full bathrooms with tub/shower combination and shared sink/vanity area, and one open shared living area. There are two shared stoage closets. Each suite has two double bedrooms with closets, two full bathrooms with tub/shower combination and shared sink/vanity area, and one open shared living area. Learn how Burlingham was built to be smarter, greener and packed with futuristic innovation through its Green Building Handbook (pdf). The book also gives residents tips on sustainable living.